Hi good readers, a quick update especially for those within the confines of San Francisco. I have two very great, very fantastic events for you! The first is tomorrow night…Cocktails and Crafts with Etsy! Etsy is opening a new engineering office in San Francisco (interested? ), and we want to get to know our neighbors. We don’t have office space locked down just yet, but thanks to our friends at Covered Communications and Pier 38 we’re not letting that slow us down! Come on by June 10th between 7 and 10 pm PT to meet Chad Dickerson (Etsy CTO) and make some sweet, geeky crafts (did someone say DIY screen-printed mousepad?) and have a cocktail or two on us. For more info, visit Women 2.0 and Code as Craft. The second event is this weekend. Juliette Melton, of lightbulb terrarium fame, is having her first terrarium art gallery opening at Modern Eden! So go pay her a visit and perchance purchase one of her amazing light bulb terrariums while you’re at it. On Saturday June 12th, join us in celebration of our new art gallery. Over a dozen local artists will be showing their work from paintings, sculpture, and jewelry. Hope to see you there and bring your friends! Thanks for the support. 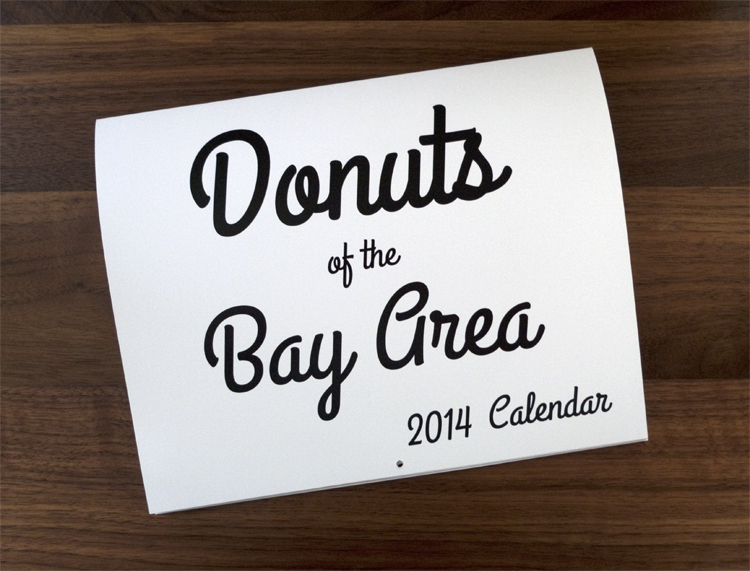 So if you’re looking for something to do, get out there and support San Francisco crafters! This week’s internet spoils are few but worthy. Let’s get right to it! I’ve been a fan of Christopher Bettig‘s work since laying eyes on a kelly green lyric-inspired screenprint he made awhile back. At some point, I signed up to receive his email updates. He hinted at a limited edition watch and boy, upon the big reveal, it wasn’t at all disappointing. 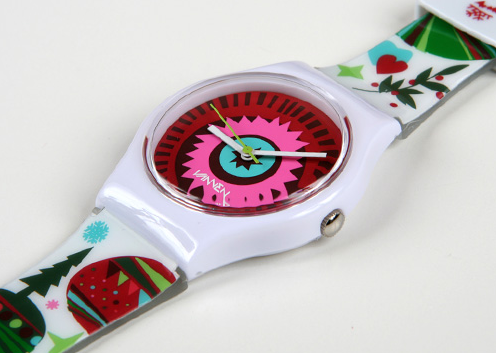 This great winter-themed watch is colorful and fun, blocky and I LOVE the fact it’s white! I would wear this thing in a heartbeat even though I haven’t worn a watch in years. Homeboy also has an etsy shop that features more of his great art. Check it! Craftster is home to many crafty (duh) people (double duh) from all backgrounds. The forum contests inspire meaningful creation and it seems like a very supportive and experimental community. It’s no surprise that this super-awesome top stitch dress that caught my eye was posted on Craftster. Dude, perfection! It’s amazing that something so simple (and yet, a challenge to actually make) can have such a striking effect. Thanks to Craft Magazine for the clue. 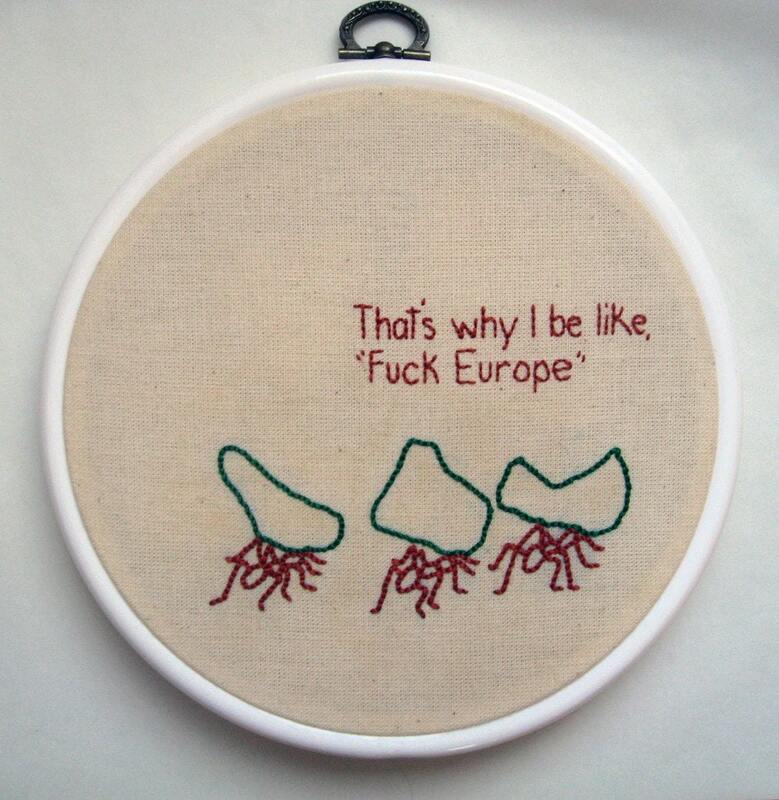 The ever fashionable Ali suggested I check out the work of one What Party over on Etsy. Although there are only two (SAD FACE) embroideries available for sale now, keep your eyes on future offerings! Mr. Helvetica himself, Randy tipped me off that the fantastic Vader photo by Alex Brown is $99 as a holiday special. What a deal! Le sigh, if only. 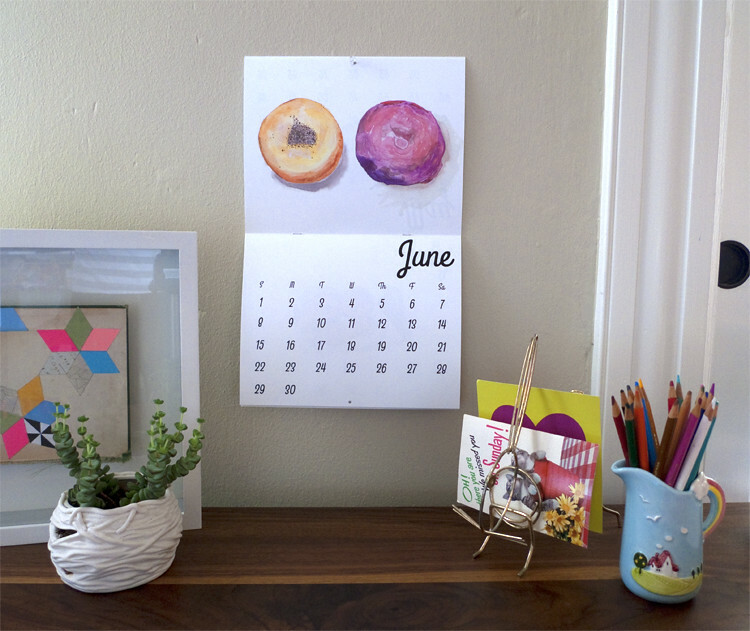 A note for any San Francisco people: the Bazaar Bizarre craft fair is this weekend! I’ll be helping Willotoons in the afternoon, so stop by the booth, perhaps buy something and say hi! Could it already be the almighty fifth I wwwant that! post? It is! Join me for a weekly meditation on rather pricey internet goods and the people (me) that love them. Clearly there’s some part of my brain that is made of straight rainbow. There is no gray matter, it’s all multi-color. That is the ONLY explanation I can come up with as to why I’m so attracted to bursts of bright. 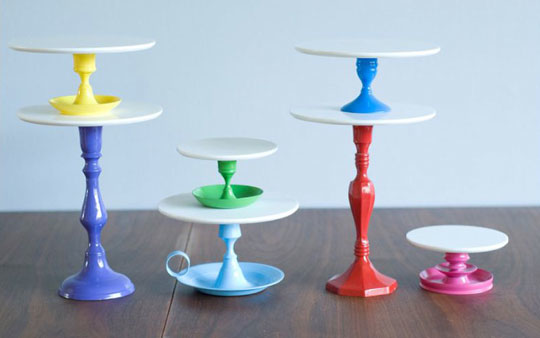 The Kitchn got my neurons snapping when they posted these brilliant cake plates. They’re made from old candle holders and were given a powder coat once over by some enterprising souls at iacoli & mcallister. Bravo. 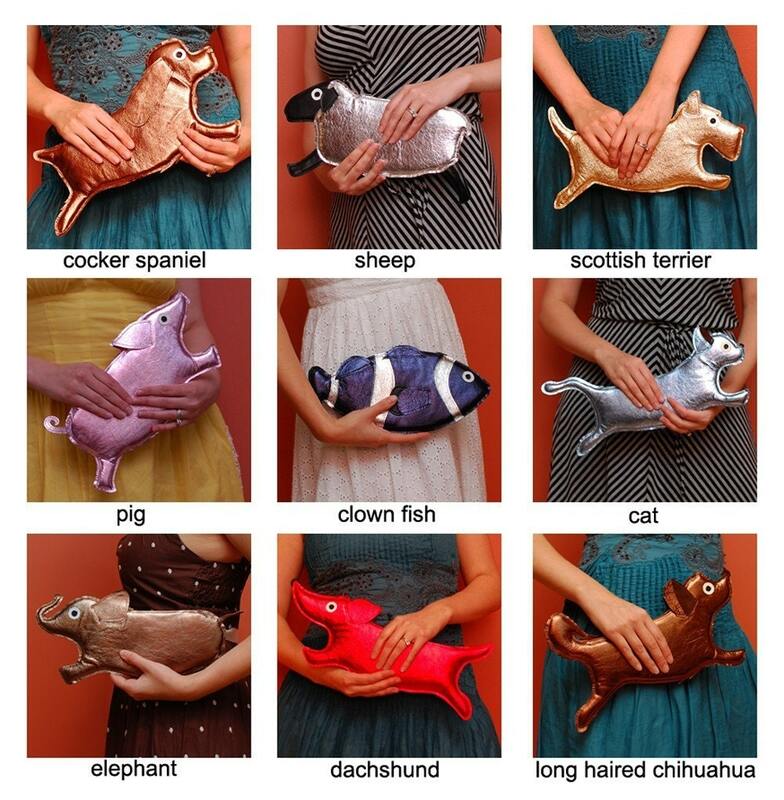 Fan of quirky purses but low on cash? Avert your eyes from TsuruBride’s Etsy shop. She makes one mean animal clutch and I’m not talking about the terrible hen purse . My favorite? Definitely the squirrel. A thanks to Croqzine for twittering a featured seller link that let me down this dark, leathery, cute road. There’s something so wholesome and pure about any article of clothing that features a BIG FLOPPY BOW. 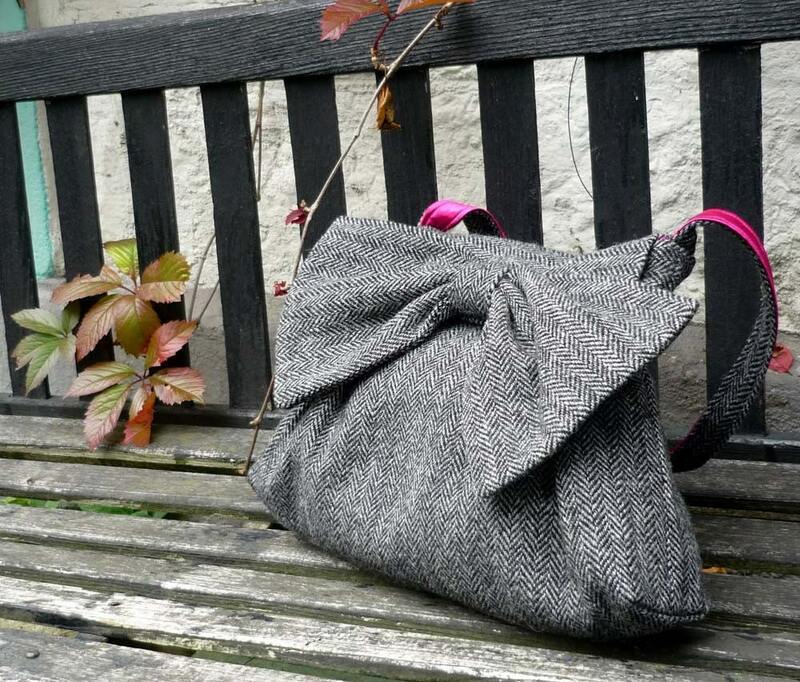 That’s probably why I went a little nut-so when I saw these great purses by Breagha on the superfantastic Modish blog. (Oh look, it’s yet another purse I wwwant this week. Trend anyone?) Unlike the previous petite clutches, these are big bags, featuring a nubby finish in autumnal colors and patterns. 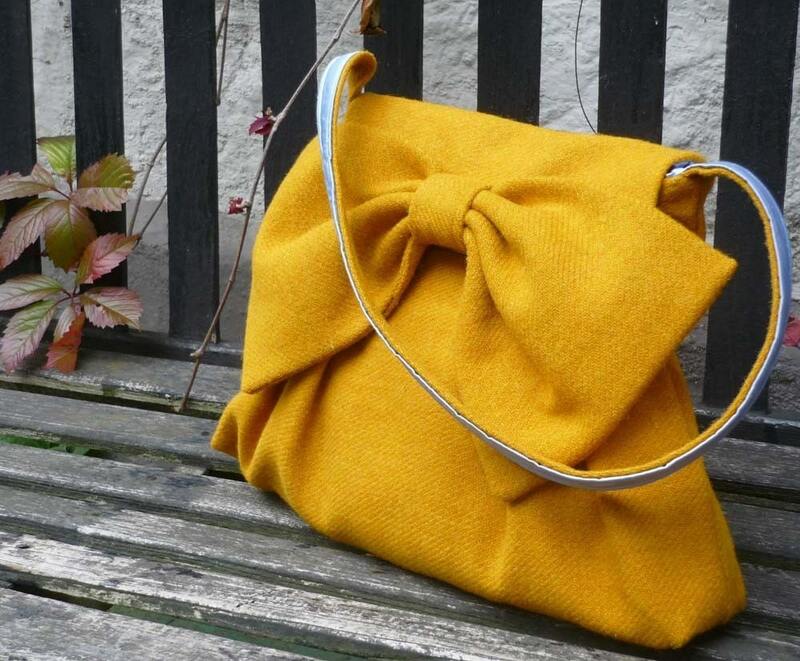 I can’t decide whether I’d rather picture myself using the yellow or the herringbone purse. Good thing I don’t have to pick. Gimme both, imagination! Most pan racks lack pizazz. They’re all heavy-duty steel this and that. Serendipity and Spark found the perfect whimsical solution. It’s got colors, swoopy lines and a smattering of color. Does your kitchen yearn for this home item and are you blessed with a large bank account? Buy it on the Supermarket HQ website. How do you feel about industrial felt? What about take-out style boxes? And if they have a face? What if the handle is the face, does that creep you out? It doesn’t? 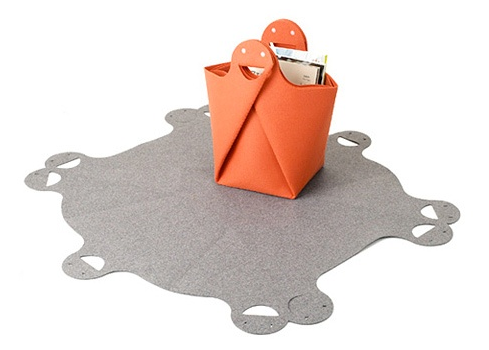 Well then, you’ll love these folding buckets made by VivachiStyle. Do Something Pretty did something pretty when they shared these great utility buckets. 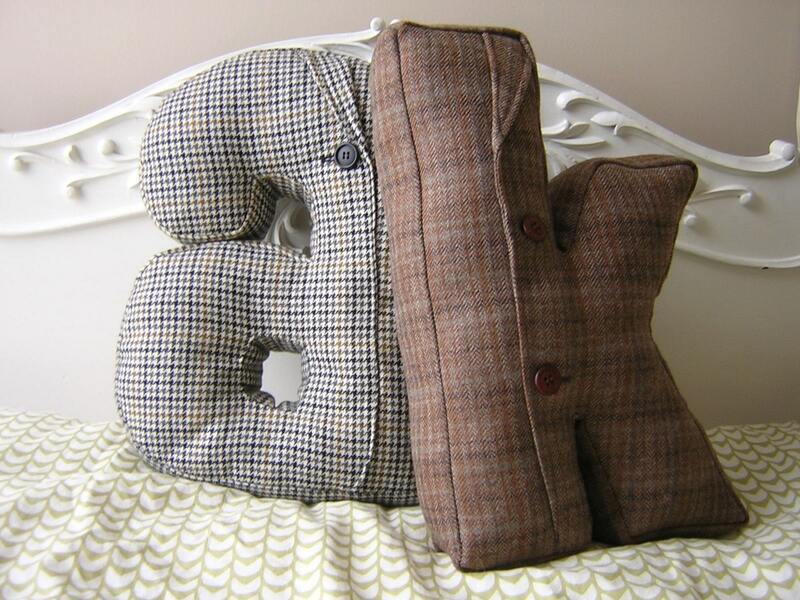 Another craft and design emporium, IndieFixx, is hosting a giveaway. It’s $50 bucks to spend on the Modish Vintage store. To play, you had to find something you like in the Modish Vintage wares and post it in the comments. 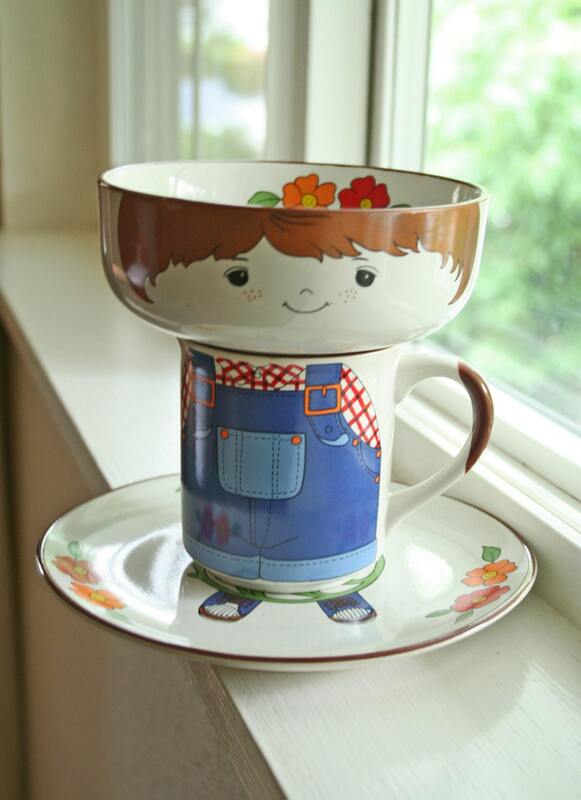 I found several things I liked but nothing I really LIKED until arriving at this adorable little boy porcelain dish, cup and bowl set. Say it with me now, HOW FRIGGEN CUTE! If I had more than the scrap of money left to my name I was SURELY shell out the $30 bucks to bring this fella into my home. That’s it for this week’s I wwwant that! Do chime in if you love any of these items. And definitely don’t hesitate to share other covetables if you’ve been scoping out something delicious.